Come explore the exotic aromas and flavors of Misty Fumes, a new electronic cigarette shop located in the heart of Yerevan. 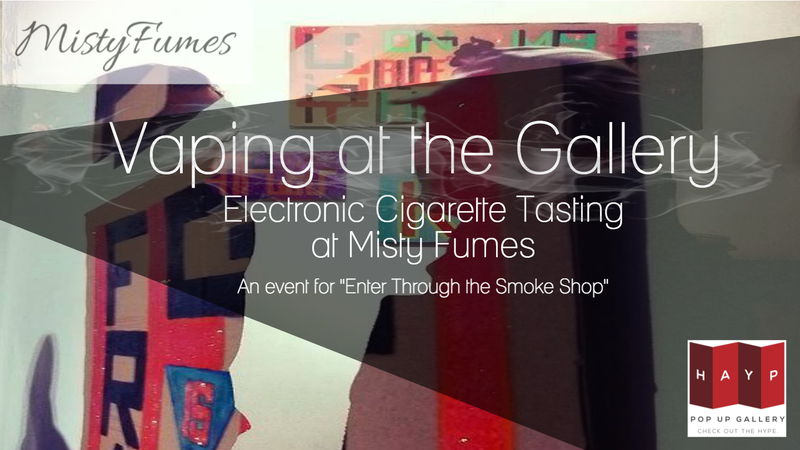 During this special event co-hosted by Misty Fumes and HAYP Pop Up Gallery, guests will be able to taste different electronic cigarette flavors – including a special deluxe flavor normally not available as a sample. They will also be able to visit HAYP Pop Up Gallery’s exhibition “Enter Through the Smoke Shop”, a solo show of artist Samvel Saghatelian located in the backroom of Misty Fumes. An exciting event for literary fans, urban lovers, rebel-spirits, or anyone just looking for some laughs, fun, and entertainment. “Useless Personal Protests” is a literary “slam”, or open-mic in which guests are invited to share their poetry or spoken word based on the theme “useless personal protests”. Any language allowed, open participation, performances should be up to three minutes… Performances will be accompanied by bongo drums played by Shant Kerbabian. Following our poetry slam will be the chance to speak with “ENTER THROUGH THE SMOKE SHOP” artist, Sam Saga, who will briefly explain his thoughts and ideas behind his provocative protest signs. This will be an informal presentation in which we invite the audience to ask questions. To finish off the evening: an exclusive “Enter Through The Smoke Shop” wine presentation with limited edition, signed-by-the-artist wine bottles. What wine you ask? A unique made-in-Karabakh Khndoghni wine that is not available in stores (currently only available at In Vino). Make sure to get your bottle! Only 12 available (15,000 AMD each).